Every year, your dog goes in to the vet clinic for her annual examination. She gets her booster shots, is checked for internal and external parasites, and, typically, has a veterinary dental cleaning to remove all the tartar and plaque from her teeth that has been building up over the previous months. Those veterinary cleanings are usually performed under general anesthesia – a procedure that can be costly and, in the case of elderly or ill dogs, may not be in the best interests of your pet. Learning how to brush your dog’s teeth at home may save your pet from a veterinary dental cleaning, and prevent her from experiencing the ill effects a dirty mouth – and periodontal disease – can produce on her general health. Why are clean teeth so important? When your pet eats, food particles congregate in the furrows of her gums and palate, gather around the roots of her teeth, and remain there to attract the bacterium that feasts on decaying food. This bacterium is the precursor of the yellow tartar you see on her teeth. That tartar later hardens into plaque – that concrete-like substance seen deep in your dog’s mouth around the pre-molars and molars. Once the bacteria establish a home in your dog’s mouth, it grows and multiplies and travels throughout her body in the bloodstream. This same bacteria can cause kidney, heart, and liver disease if allowed to stay in your pet’s body. How can I brush at home? The first step to brushing your pooch’s teeth at home is getting her accustomed to having either fingers or a toothbrush rubbing up against her gums and teeth. The best way to teach this is to hold her head in your lap while she’s relaxed. With one hand, gently lift up her lips, and, with the other hand, run your index finger over the outer portion of her teeth and gums. If she resists, lightly grasp her muzzle in your fingers and continue rubbing her gums with the other hand. Don’t stop until you feel her body relaxing. Continue this practice regularly a couple of times a day until she no longer rebels at having fingers in her mouth. Once she’s comfortable having her mouth manipulated, purchase either a doggy toothbrush or a finger brush from your vet or local pet store. Cover the bristles of the brush with a specially-formulated doggy toothpaste found at your local pet supplier or veterinarian. Rub the brush along the outer portions of her teeth and gums. You don’t need to open her mouth and clean the inside of her teeth; her tongue performs that function as she’s eating. Don’t bother rinsing her mouth. Canine toothpastes are made to be safe for swallowing. ***Please Note: Never use human toothpaste for your dog as some of them contain chemical ingredients that can be injurious to your pet’s intestinal tract. Brush your dog’s teeth at home at least twice a week for optimum dental health. What other ways can I prevent canine periodontal disease? Many holistic veterinarians recommend raw beef bones as a way to clean your dog’s teeth while she’s enjoying chewing on a tasty treat. Hard, raw carrots and dental cookies also remove tartar and plaque as they’re being eaten. Special dental chews made with dental abrasives provide your dog with the chewing action she craves, while cleaning and deodorizing her teeth and gums. 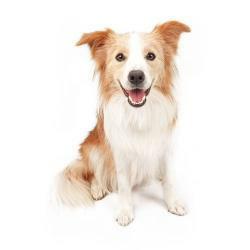 Regular brushings at home, combined with dental checkups at your veterinary clinic, can help your dog retain all her teeth to a ripe old age, while keeping her heart and other vital organs free from chronic disease.